中国企业对美国的投资热潮消失了 [美国媒体] The Chinese investment boom into America has almost completely vanished. New York (CNN Business)The Chinese investment boom into America has almost completely vanished. 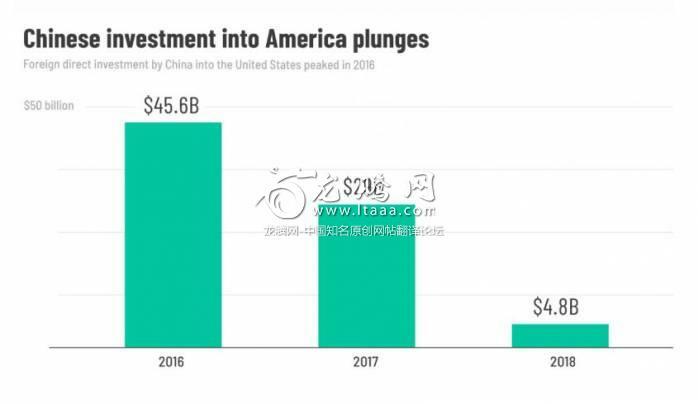 Foreign direct investment from China into the United States plummeted by 83% in 2018, according to a report released Monday by law firm Baker McKenzie. After spending heavily on American real estate, transportation and infrastructure, Chinese investment in these sectors has "largely disappeared," the Baker McKenzie report found. China has retreated from other major markets — foreign direct investment into as a whole Europe tumbled by 70% in 2018, for example. But the United States has experienced the sharpest decline. Some large economies, including France, Germany, Spain and Sweden, experienced an increase of investment from China, Baker McKenzie said. Canada also bucked the trend, with Chinese investment spiking by 80% to $2.7 billion last year. Including divestitures, Canada actually enjoyed more Chinese investment than the United States in 2018, Baker McKenzie said. Likewise, HNA, a conglomerate that grew out of an airline, has gone on an epic buying spree in recent years. The Chinese company purchased chunks of everything from Deutsche Bank (DB) to Hilton. But HNA has since moved to unload businesses in response to Beijing's crackdown on foreign purchases and concerns about the company's massive debt. "HNA had its wings massively clipped," said Kennedy. Correction: An earlier version of this report incorrectly described part of HNA's business. Duh .. we're heading into a worse global recession.